The wind turbine in the village Libbenichen – Concept for preservation. A carved wainscotting around about 1720 from the Boeselager Hof in Bonn. Stock of Grassimuseum /Museum of Grafts, Leipzig. Argumentation in proving origin, technological test and drawing up a plan for . conservation and exhibition. An engraved and tinned copper tray from Syria. Technology and conservation. The large gas engine No. XIII from the former Halbergerhütte iron works, Saarbrücken (Germany). Planning of the preservation and restoration of a technical monument. Consolidation of the gipsum contaminated vault paintings in the St.Maries Church, Herzberg/Elster. The crucifixus dolorosus in the parish church of the Assumption of the Blessed Virgin at Andernach-on-the-Rhine. An examination about its technology and the present condition as well as making proposals about conservation treatments. A Contribution to Conservation History: Historic Materials Used in the Conservation-Restoration of Antiquities, as Found in Selected Marble Sculptures from the Antiquities Collection, National Museums in Berlin, Prussian Cultural Heritage Foundation (Staatliche Museen zu Berlin, Preußischer Kulturbesitz). A One-Horse Caroussel-Sleigh from the Historical Museum Hanover (Inv.-No. VM 3166). Examination and Elaboration of a Concept for a Treatment. The relief intarsia from Eger. History and technology, Art historical research on the example of the panels of the Passion of Christ cycle from Adam Eck, ca. 1640/50. Conservation strategy. Development and application on the relief panel “crucifixion of Christ“ from Adam Eck, ca. 1640/50. Trinitatis-Altar of the former Hildesheim Trinitatis-Hospital at Hildesheim Saint Bernward-Church. Investigation of the Altar and chosen Sculptures and Development of Ideas for the Treatment of Conservation and Restoration Problems. The Sculpture of St. Antonius of Padua of the St. Michael’s church in Weißenborn-Lüderode (Thuringia). Conservation treatment on the base of an existing concept and development of a concept for a further restoration. Conservation of an Europa Junior „Klarton“ loudspeaker combination of the Klangfilm GmbH. lorentine Cradle – Removal from the Back of a Double-Sided Altar Painting, ca. 1510 Church of St. Lawrence in Bludenz, Vorarlberg. Therochlitzer porphyry tuff – possibilities of consolidation. Martin Schnell's Lacquered Cabinet in the Arts and Crafts Museum of Budapest. Making, Restoration History, a Comparative Analysis of Techniques. The application of laser radiation in the cleaning of glazed terracotta - Preliminary investigations. The Dietkirchener Kruzifix (probably 12. century, Rheinische Landesmuseum Bonn, Germany, Inv.-No. V 151. Technological investigation, creation of a concept and Samples of treatment. Silicate brick preservation - comparison of select strengthening agents for the structural consolidation of the Loderslebener silicate brick. The confirmation room of the Grunewald-Church in Berlin – restauratoric safety measures of the wooden furnishing of 1903 and realization of a concept of treatment. Red Pigmented Bacteria on Architectural Surfaces. The Significance of the Constitution of the Well Wall Concerning Inhibitation and Potential Health Hazards. St. Peter's Chapel of the Old Church in Idensen. 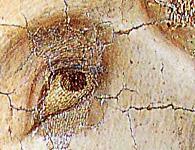 Studies on its restoration history and a conservation concept for its 12th century paintings. The study focused on gypsum treatment based on previous results and micro-biological aspects. A Painted Four-Door's Cabinet from the Historical Museum Hanover (Inv.-No. VM 30665). Restorative Examination with Special Regards to its Original Shape as well as the Outlining of Restorative Measures. A painted and crumpled shroud fragment from the Egyptian Museum of Berlin. Conservation-Preservation-Identification. Conservation of waterlogged archaeological leather. The formation of soaps and their removal. The library in the Castle Babelsberg. Restorical Investigation, Suggestions for conservation/ restoration. Combinations of biocide treatments and surface coatings of limestone are examined concerning their suitability as a protection layer against microbiological growth and its harmful effects. Investigation on selected synthetic resins for a consolidation of differently preserved paint layers and calcite stone. Development and history of synthetic dyes in wood stains. A source research and a conservators reflection as an contribution to art-technology of the 20th century. Shown by the developments of new stains by the chemist Wilhelm Zimmermann and the stains produced by ARTI in Barmen/Wuppertal, Germany. The pulpit and laic altar in the Neuwerkkirche in Goslar (Germany). Technological examination of the historical paint layers, development of a concept for the conservation and presentation. Double-winged shop-door around 1890, of a subsequent shop fitting into a dwelling house in Berlin-Lichtenberg.Technological investigation and formulation of a conservation plan. Relic altar of the cistercian monastery church of Loccum. An archaeological object of the baroque period. A Telleruhr from the former Potsdamer Stadtschloss. The wall paintings of Adolf Quensen in the choir of the St. Lorenz Church of Schöningen. Development of a conservation concept and recommendations for further treatment. A varnished fire-screen (mid-19th-century) with painted scenes of Venice, formerly part of the interior decoration in the suite of the Prussian King, Friedrich Wilhelm IV, in the Charlottenburg Palace. Examination of materials and manufacturing techniques, treatment proposal and its application in a test area. Three radios made by SABA in the Second Third of the 20th Century from the Herbert Schroff's Collection of the Franziskanermuseum Villingen. A Technological and Conserving Examination of the Plywood Cases. An early type-bar writing machine with a type-basket manufactured by Frister & Rossmann, Berlin, in 1896. Polychromed coffin lid of a man named Bak from Abusir, Egypt, about 600 BC., from the Museum für Völkerkunde Hamburg, Inv. Nr. C3712. Technological examination and treatment concept for conservation. Compilation of a collection of documents on the qualitative analysis of corruptive salts in buildings for conservation specialists. Temporary documentation - problems, possibilities, limits. The problem of flaking gelatine emulsion as typical appearance on historical glass plate negatives. A Painting of Mount Calvary of the 17th Century from St. John Church in Lüneburg, Germany. Examination and development of a Draft of Treatment under Consideration of painting layers and their removal. A central European gentleman’s jacket of the first half of 17th century. Documentation and conservation. Including a study of difficulty concerning black dyed silk. Digital ascertainment an delineation of the ground monument „Wysburg“ in its spatial surrounding and investigation of the fortification structure with a rampart-ditch trench. Wall Paintings of the Choirchapel the Roman-Cath. Church St. Martin, Filzingen (Germany). Development of an interactive CD-ROM on the analysis of pigments, with particular consideration of polarization microscopy. A bronze bell from the bell-foundry K. Hamm in Regensburg. Sound analysis in connection with the restoration and the removal which was necessary for the restoration. Textiles - a challenge in dealing with Technical cultural Property. Upholstery and fabric coverings in a car of 1926. Influence of consolidation treatment on subsequent desalination. Wallpaintings of the church St. Andreas in Burgsdorf, Germany. Developing a conservation concept with spezial attention on reducing a starch glue film. Types of Wood Used to Imitate Ebony – Historical Written Sources and Practical Implementation. The Late Medieval Representation of the Last Judgement on the North Wall of the Choir of the Church of St. Gallus in Lemwerder-Altenesch. Prospects of Conservation by Means of Protective Coating? Study into the suitability of reactive methyl acrylate adhesives for the conservation-restoration of museum stone objects. Ultrasonic Testing as a Non-Destructive Investigation Technique in Conservation Science for Locating Defects in Wooden Objects. Wall-paintings on concrete slabs in the church of St. Jacobi, Wanzleben (Germany). Investigation into the specific causes of deterioration.